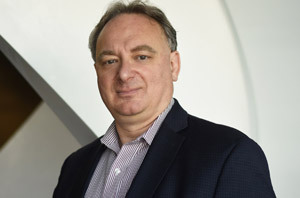 Dr. Laszlo Radvanyi brings a strong oncology research background in academia as well as leadership experience in international pharma and biotech, making him an ideal leader for OICR. Laszlo was educated at the University of Toronto, earning a PhD in Clinical Biochemistry in 1996. Laszlo joined OICR from EMD Serono (Merck KGaA, Darmstadt, Germany), where he was Senior Vice President Global Head of the Immuno-Oncology (IO) Translational Innovation Platform (TIP) and Senior Scientific Advisor for Immunology and IO. While at EMD Serono, Laszlo rebuilt and re-organized its IO research platform, hiring key talent, and re-focused and rejuvenated the IO R&D pipeline. He also established key academic alliances focusing on biomarker-driven clinical trials. At EMD Serono, Laszlo also played a role in an alliance with Pfizer developing anti-PD-L1 (avelumab) and co-led EMD Serono’s CAR T-cell program in partnership with Intrexon and Ziopharm. Prior to joining EMD Serono, Laszlo was a Professor in the Department of Melanoma Medical Oncology at the University of Texas, MD Anderson Cancer Center in Houston for 10 years. While at MD Anderson, he established a GMP-grade T-cell therapy manufacturing program for metastatic melanoma using expanded tumour-infiltrating lymphocytes (TIL) and performed basic research on TIL biology and effector function. In recognition of his research accomplishments, he was awarded an MD Anderson Division of Cancer Medicine Research Award. Laszlo also has small biotech experience and was founding CSO for Iovance Therapeutics, commercializing T-cell therapies for melanoma and other cancers. He designed and built the biotech’s R&D facility in Tampa, Florida and led research and development activities leading to two IND submissions. Among his other current activities, Laszlo is on the Keystone Conferences Scientific Advisory Board, is an Associate Editor for the Journal of Immunotherapy for Cancer (JITC), and has served on grant review panels for numerous national and international agencies.